The Swedish Royal Air Force photo interpreters were pleased with the performance of the HK 7 HandKamera. So, later in 1941, they asked Victor to design and build an aerial camera to fill a different need. This camera was to be permanently mounted in the belly of a similar or larger airplane, with the lens axis perpendicular to the ground and with a larger picture format. Such a camera would record the ground picture area with enough detail and registration to make decent cartography possible. Also if the flight line was held at constant altitude and azimuth, and the sequence of exposures spaced with about a 60% overlap, the photos could be used for stereoscopic photo interpretation. Victor and his work crew started work on this new aerial camera promptly and within several months they had designed and built a 12 x 12 cm format, rigid mount camera known as the Flygseriecamera type SKa 4. The SKa 4 was electric motor driven and picture spacing could be controlled with an intervalometer. The camera had interchangeable lenses and an innovative interchangeable film back. The auxiliary optical viewfinder had a viewing magnifier to observe with greater clarity the area being photographed. This auxiliary viewfinder was designed to protrude beneath the floor of the airplane. Another thoughtful innovation was the stamping of the date, hour and minute of exposure on the edge of the film frame. The design of the SKa 4 was somewhat unconventional. The complete camera system included three lenses: 15cm, 25cm, and 40cm. The 15cm lens mounting was unusual in that it was mounted inside the camera and folded away when one of the other lenses was mounted in the bayonet. If the 15cm lens was in use one had to attach a clear glass or filter in the bayonet mount. The SKa 4a was a variant of the SKa 4 that had no provision for a permanently mounted 15cm lens that folded away. 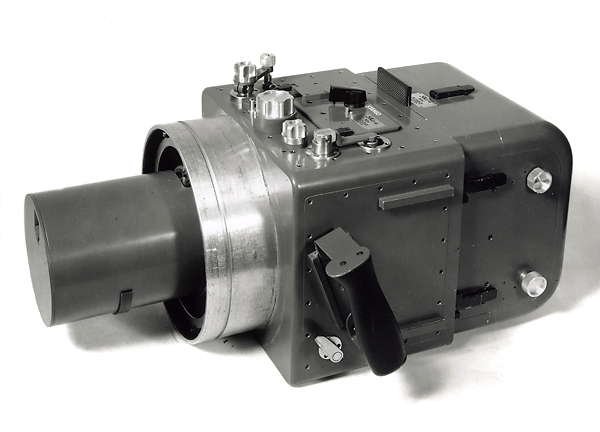 The SKa 4a camera body was simpler, smaller and lighter, which provided a bayonet lens mounting facility only. Cast aluminum. The camera was convertible for multiple uses. It could be attached to a rigid (fixed) frame which was secured to the belly of a plane, or it could be removed from the frame and used as a hand camera, since it came with two side handles. Weight: 14.9 kg. with 15 cm lens attached. Weight of 250mm lens alone: 1.7 kg; 500mm lens alone: 2.4 kg; mounting bracket: 6.2 kg. Probably a spring loaded plate inside the interchangeable back that was raised by a cam during film advances, as in the MK80. Picture size is 12 x 12 cm. Special roll film, double perforated 13 cm wide. Power cables to DC power supply; airplane circuitry or battery. 40 cm Hugo Meyer Tele-Megor. Special auxiliary magnifying viewfinder mounted through port in airplane belly. Viewfinder looked like a long thin telescope. It attached to the side of the camera via an oversized accessory shoe holder. Could be controlled with included intervalometer. Red, green, and yellow filters. Filter mounts and adapter ring. Lens cap, dust brush, cleaning cloth. Carry strap, transport box and moving box. Template for trimming film tip for loading. A complete kit also included all three lenses, and a mounting bracket (6.2 kg). A most important accessory was a frame for mounting the camera rigidly to the belly of an airplane. The camera lens collar fit inside a ring held in a square holder. The ring could be tilted side to side inside the square holder, while the square holder could be tilted fore and aft on the frame legs. This allowed adjustment of the lens axis to be perpendicular to the ground. The camera could be rotated inside the circular ring holder and locked in place. This allowed the camera to be adjusted for crabbing of the plane when flying into a wind that was at an angle to the airplane flight line. Unusual 12 x12 cm (4.7 x 4.7 inches) photo format. 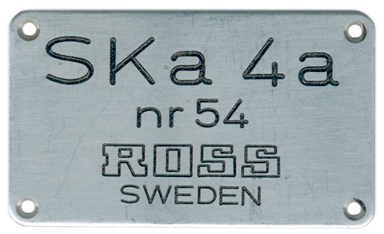 Rapid design, prototyping and start of series manufacture of the SKa 4 attests to the nimbleness and cooperative effort that must have prevailed at the Ross factory. The interchangeable back was a feature of all commercial V System cameras. The integrated electric motor drive was used in the EL camera and following EL(...) cameras, including the NASA Lunar EDT cameras. An auxiliary viewfinder was available on commercial cameras for sports action photography. A viewfinder with optional magnification was available on all commercial cameras. These are the dimensions reported by Stadsmuseum Goteborg. Length is 21.5 cm shorter than the length reported for the SKa 4. The photographs of the two cameras are not that clear, but it appears that an intermediate spacer is missing from the SKa 4a specimen. This intermediate spacer lengthened the body of the SKa 4, so that the permanently mounted 150mm lens could be moved aside. Camera No. 51 has a five leaf behind-the-lens shutter. Serial numbers may have been interspersed with SKa4 serial numbering.